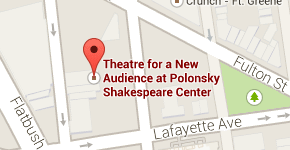 Polonsky Shakespeare Center is located near all major subway lines, a variety of bus lines, and the LIRR. Subway: Take the 2, 3, 4, or 5 to Nevins Street; B, D, N, Q, or R trains to Atlantic Avenue-Barclays Center; the C to Lafayette Avenue; or the G to Fulton Street. Please check the MTA website for service changes. From Nevins Street Train Station: Head northwest on Flatbush Ave. Turn right onto Fulton St. Turn right onto Ashland Pl. Polonsky Shakespeare Center will be on the right. From Atlantic Avenue-Barclays Center Subway Station: When exiting the station, follow exit signs marked “BAM/LIRR”. Walk through the LIRR station to exit at the intersection of Flatbush Ave., Hanson Pl., & Ashland Pl. Walk north on Ashland Pl. for 1.5 blocks, and Polonsky Shakespeare Center will be on your left. Bus: The B25, B26, B41, B45, B52, B63, and B67 buses all stop within a few blocks of our theatre. LIRR: The Long Island Rail Road stops at Atlantic Terminal, which is located two blocks away from our theatre. Citi Bike: The nearest Citi Bike station is located at the corner of Fulton Street and Rockwell Place. For information about elevator access to and from the Atlantic Avenue-Barclays Center subway station, please click here. Public transportation is the easiest and quickest way to get to our theatre. However, if you are driving, please allow additional time for traffic and parking, especially on evenings that coincide with events at the Barclays Center. From Downtown Manhattan or FDR Drive: Take the Brooklyn Bridge. Turn left on Tillary St. Turn right on Flatbush Ave. Turn left on Fulton St. Take the second right onto Ashland Pl. Theatre for a New Audience will be on your right. From Manhattan’s West Side: Take the West Side Highway to Canal St. Exit left onto Canal St, which feeds directly into the Manhattan Bridge. Across the bridge, continue straight onto Flatbush Ave. Turn left on Fulton St. Take the second right onto Ashland Pl. Theatre for a New Audience will be on your right. From the BQE (East or West): Exit at Tillary St. At the second light, turn left onto Flatbush Ave. Turn left on Fulton St. Take the second right onto Ashland Place. Theatre for a New Audience will be on your right. The parking lots located at 622 Fulton St. and 9 Lafayette Ave. are currently closed. GGMC Parking offers TFANA patrons a $5 discount at the 66 Rockwell Place garage. Coupon can be printed in advance or redeemed using a mobile device. Please note: Discount is not applicable on Early Bird, Weekend Special, 1/2 hour or 1-hour rate. Credit card payment only. You must present coupon upon checkout in order to receive discount. This coupon expires on December 31, 2019.